The Candijay mangrove forest is one of the most diverse in the country and boasts of at least 36 species. Some of the mangrove trees are century-old and look gaunt and old. Majority of the trees are of the “bakauan” type (Rhizophora Stylosa) who has arching stilt roots emerging from the trunk. In Greek, Rhizophora Stylosa means “root bearer”. The bakauans generally live in inter-tidal areas which are inundated daily by the tides and have adapted to brackish water conditions and are salt-tolerant. These trees develop into tall trees. The roots hold up the tree in soft mud and help the tree to breathe. With roots emerging from the branches, the tree looks very attractive. Mangrove specie also found along the rivers of Candijay is the nipa palm. It has a horizontal trunk that grows beneath the ground and only the leaves and the flower stalk grows upward above the surface. It cannot be considered a tree, although the leaves can extend up to 9 m (30 ft) in height. The flowers are a globular inflorescence of female flowers at the tip with catkin-like red or yellow male flowers on the lower branches. The flower yields a woody seed, these arranged in a cluster compressed into a ball up to 25 cm (10 in) across on a single stalk. The ripe seeds separate from the ball and are floated away on the tide, occasionally germinating while still water-borne. 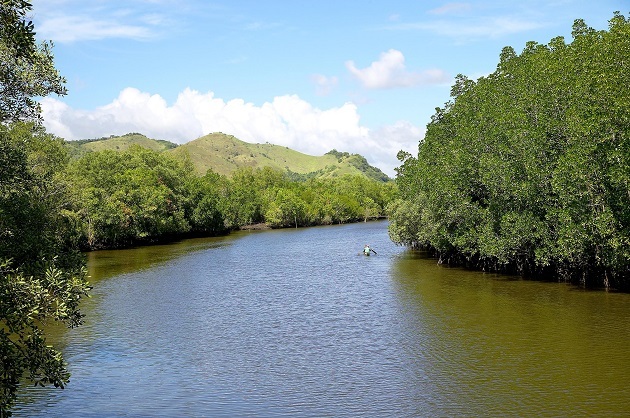 The thick bakauan mangrove forest has become a bird sanctuary aside from it being a habitat for the fishes and other marine life. The area has become a spawning ground, a nursery, as well as feeding ground and shelter to the hundreds of fish species, crustaceans and invertebrates found in the area. The tangled and intricate root systems provide a safe place for this marine life to grow, away from many predators of the sea. The muddy waters around the mangroves are the main source of food. It is rich in nutrients coming from leaves that fall into the waters, decomposes and is covered by large amounts of small organisms which coats the leaf particles and becomes food. Today, the Candijay mangrove forest is a tourist destination. The PAMAS organization has set-up a boardwalk and bamboo bridges for the convenience of the tourists when they explore the innermost area of the forest or go bird watching. River cruises are offered along Candijay’s rivers Cabadian, Matulid and Sagomay while members of the group serenade the tourists during tours. Tour guides are available and they give out bits of information about the mangrove, the different species, their scientific names and their uses. With an initial membership of 40, the group has grown to more than a hundred members and their once poverty-stricken barangay has much improved. They have successfully promoted the mangrove area into a tourist destination. For guided tours, contact PAMAS at telephone number 526-0197. The local residents of Candijay eat the bakauan ‘babae’. The bakauan is peeled and eaten and the lugs of its stem are made into wine. The bark, roots and fruits make good mosquito repellants, and is a known cure of asthma, fever, convulsion and sore throat. The mangrove is also a source of firewood and charcoal, and the stems are used as poles for fish traps and as housing materials. Shells, crabs, other mollusks and crustaceans proliferate in the mangrove area and are a source of food of the local residents. The Candijay mangrove forest is located in Barangay Panadtaran, Candijay town, Bohol, Philippines. The town is in the eastern part of Bohol about 92.2 kilometers from Tagbilaran City, a two-hour ride away. The town was established in 1879 with a land area of 8,687 hectares consisting of 21 barangays. The name of the town is said to have come from the words “Kang Dihay” meaning belonging to Dihay, a strong man with many followers. The name was eventually changed to Candijay and was organized during the Spanish regime. CVSCAFT School of Fisheries is in Candijay offering college courses related to modern fishing methods and fish preservation.